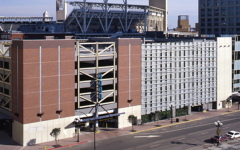 The 6th & K Parkade provides parking for the Gaslamp Quarter, East Village, San Diego Convention Center and Petco Park, home to the San Diego Padres baseball team. The below-grade level serves as valet parking for the adjacent hotel and mixed-use retail spaces located along K Street, with restaurants and sidewalk seating along L Street. 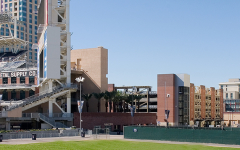 A public gathering area was designed on the ballpark side of the garage for events prior to game time. 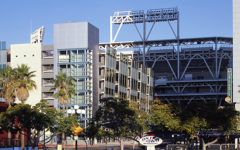 The structure has a double-helix ramping system which allows the five-story garage to be easily loaded and unloaded for events at Petco Park and the Convention Center. Four of the seven elevators and all of the stairs are glass enclosed, giving the parking structure a contemporary but elegant look.